April 21st/22nd: In Baltimore at the Big Shots tournament, the 15U boys suffered a setback in their 1st game, but quickly recovered until falling in the Silver Championship game to a very good MD 3D squad. The 16U boys were also in Baltimore, and after falling behind 14-0 to start their first game, they closed in on eventual-tournament runner-up Squash All Beef, but couldn't overcome the early deficit to the athletic and burly SAB players and lost by around 12. In their next game, the 16U boys led for a majority of the game versus the eventual-Silver Champions Brooklyn Badgers, but a rough patch late in the 2nd half was the demise for the squad and they fell by 7. April 27-29th: The 16U boys opened on Friday night versus Florida's Boca Raton PAL Vipers. Playing shorthanded, the boys' fell into an early hole but recovered in the 2nd half, pulling within 5, but used up all its energy scrapping back that it couldn't overcome the first half deficit. Lost in the shuffle and disappointment of losing Friday night's game was that the team's effort in making a comeback turned the heads of a whole line of college coaches observing, including staff from Alabama and Notre Dame. In Saturday's two games, Coach Savercool's team couldn't put together a full 32-minute game and squandered 18-point halftime leads TWICE. A disappointing weekend for the squad, but one that'll make the kids and team better because of it. The 15U boys began on Saturday versus Crusader Nation out of Maryland. While they battled for 32-minutes, they just couldn't find their rhythm and fell short to the formidable competition. In its next game, Coach Fletcher's team kept everyone on the edge of their seats and pulled off a victory thanks to a buzzer beater by Tyler Hoagland (Fr., Cedar Cliff). The team, though, couldn't keep its momentum and ended up losing by single digits Perry Hall in its Sunday matinee. May 5th/6th: The 16U boys, playing in front of a local contingent and some of their high school coaches, started slow versus CATS Basketball but exploded in the 2nd half for a 25 point victory. They then followed it up with two consecutive wins over Berks Red Storm (by 22) and Lebanon Thunder (by 40). Coach Savercool and the squad captured their 2nd tournament title of the season by defeated YC Elite by 10 in the championship game. Good work fellas! The 15U boys also excelled this weekend and made a name for themselves locally. After a dominating 33-7 win over Mid Penn Motion, the squad followed it up with two wins over Advanced Hoops, by 5 and by 33. Playing in a passionate and energetic full court trapping defense guided by Coach Fletcher and Coach Thomas, the team came together and won by double digits in a spirited championship game battle with Lancaster's CATS Basketball. Excellent job by the entire team on their 1st championship of the season! May 19th/20th: 15U: Anchored with a high-pressure, full-court trapping defense and Coach Fletcher's demanding style of outworking other teams, the squad came together and flourished this weekend. After collaring its first championship two weeks ago, the team started its weekend on the right note with a 45-33 win over Perry Hall. Not losing a step, they soundly defeated Southern Berks 64-25 and clinched the #1 seed in its pool. In the tournament semi-finals, the team faced off versus a very talented All Sports Rens club. Though hotly contested, Coach Fletcher and the team played tough and pulled off the 52-43 victory. In the tournament championship, the boys put on a show and flattened Wall 2 Wall, 70-43. The 16U boys began their weekend with a 50-43 win over King of Prussia Patriots. Up 15 at halftime, the squad couldn't quite shake their "tale-of-two-halves" demeanor but still pulled out the win. In its second game, the 16U boys put naysayers' thoughts to rest, played two complete halves of basketball, and pounded Lebanon Thunder, 68-38, and clinched the #1 seed out of their pool. In Sunday's semi-final game versus a talented, sharpshooting CATS Team, the 16U SCS boys came out flat defensively and paid the price for a half. Combo'd with 8 threes by the CATS, Coach Savercool and the team found itself down 13 at halftime. The kids showed resilience and competed in the 2nd half, eliminating the lead and sending the game to overtime. In OT, Manny Gonzalez (So., Central Dauphin) scored with 4 seconds left to cap off the come-from-behind win, 56-55. In the championship versus a 'refreshed' YC Elite, the boys came out flat yet again and found themselves down 21 at halftime. Sticking true to form, they clawed their way back into it in the 2nd half and made it a 2-point game but simply couldn't overcome the large hole they dug themselves into and ended up losing by 5. Still, a great weekend for the squad. June 2nd/3rd: The 16U boys ventured to Philadelphia this weekend for the Philly Triple Threat Summer Tipoff. After defeating West Hartford Magic in the first game by 17, the boys stunned GH Pro-Am in the second pool play game, where a near-flawless first half culminated in a 54-45 victory. After losing to Team HH in the Philadelphia Hoop Group Jamfest several weeks ago, Coach Savercool and the team came out on Sunday and earned redemption by defeating them 52-46 and clinching a spot in the championship. In the title game, a rematch versus GH Pro-Am, a late first half lull had the squad looking at a 13-point halftime deficit. In the 2nd half, down 15 with 6 minutes to go, the boys orchestrated a fantastic comeback and pulled to 1 with a minute to play. A failed possession by SCS, which would've given them the lead, was the final dagger and GH Pro-Am closed out the championship and won, 65-60. The loss still doesn't take away the fact that the boys played with heart until the final whistle and had many in Philadelphia asking, "who is South Central Select?" June 17th/18th: The lone team playing this weekend was the 16U boys, participating in the widely-popular Rumble in Philly. After two consecutive runner-up finishes at their past two tournaments, the boys were looking to collar their 3rd championship for their season. Playing shorthanded with seven bodies on Saturday due to some player commitments, they began pool play with a much-deserved win over brawny and athletic SJ Blitz, 54-49. After having a 18-point halftime lead, the boys finished their Saturday with a closer-than-needed victory over Bucks County Sonics, 53-52. After finishing as the 1st seed in their pool, bracketplay began on Sunday with an 8-team single elimination tournament. Sunday's quarterfinal game was a defensive showcase for the team, as they shutdown Delaware Elite, 54-32. In the semifinals, Coach Savercool and the boys clinched their spot in the championship game by defeating TP Panthers, 65-48. In the championship game versus nationally-recognized Team Final, the 16U boys proved they can play with anyone if they put their minds to it. After shaking their early timidness which had them in a 12-point deficit, SCS closed in quickly in the latter parts of the second half but fell short in the heated championship game, 71-67. It was a successful weekend for the 16U boys, and though they fell short, it was a great warm-up for July's live period....one in which they could surely meet up with Team Final again at the Summer Classic East in King of Prussia. July 14th/15th: The Adidas Invitational held at various locations all over Indianapolis is one of the most highly-regarded and competitive exposure tournaments held in July. The 15U boys made the 9-hour trek west to see how they'd square off against some of the nation's best. Lined up in a very competitive pool, Coach Fletcher and the boys' began on Thursday afternoon versus the host squad, Indiana Elite. IE's athleticism was a lot to handle defensively, which led to SCS dropping the game, 66-54. In the 2nd game of pool play, our north-of-the-border neighbors, Uplay Canada Elite, dropped South Central Select, 65-52. On Friday in their last pool play game, SCS defeated Detroit Stars, 64-60. After finishing 1-2 in the pool, there was a 3-way tie for 2nd place, as everyone was beating everyone. The point differential tiebreaker hurt SCS, and so they finished 4th in the pool but still qualified for the Bronze Bracket. 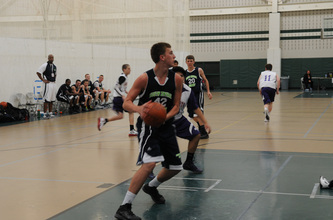 In bracket play on Saturday, the 15U boys came out blazing and dropped Grand Rapids Storm. In the 2nd round, the quarterfinals, the 15U boys again kept their momentum rolling and beat Elite Sports Center. In today's semifinal game of the Bronze Bracket (Sunday), Coach Fletcher and the team dropped a nailbiter to St. Louis Gateway, 51-47. July 20th: The 16U boys were one of 24 teams to receive an invite to the tournament. Action began on Wednesday, July 18th for them, as they opened up with the East Coast Fusion. With Coach Bobby Thomas and his 11U/12U team on the sidelines supporting them (more on that later), the 16U boys played a near flawless first half, maintained the lead in the 2nd half, and ended up dropping ECF by a score of 67-52. In the 2nd round, the 16U boys were matched up with ECE Mass, formerly named New England Playaz. An inconsistent first half had the boys with a difficult-to-overcome halftime deficit. They battled in the 2nd half, but couldn't overcome ECE Mass's lead and lost by 18. With a roster of athletic bigs and fluid guards, ECE Mass was later crowned the tournament champion, as they defeated Rhode Island Hawks in the title game. After losing in the 2nd round, SCS dropped to the Bronze Bracket of the tournament, which is the bracket for all of the 2nd round losers. In Thursday morning's game versus Team Jersey Elite, poor shooting and a 12-0 first half run by TJE doomed Coach Savercool and the team in an otherwise back-and-forth game, and they fell by a score of 60-47. The tournament concluded with a Thursday evening game versus Team Frenjie. A 7-hour break between games did not cure the team's shooting woes and inconsistencies on the defensive end continued to plague the squad. They battled to the end, but dropped their final game of the AAU season, 62-51. While a win to finish the season would have been much better, the team came a long way throughout the season, made many memories, and got a taste of an excellent AAU experience that will only improve next year. May 25-27 Gym Ratz Challenge Siena College & Albany U.
April 28-29 Philly: 17U won the Steel bracket. They lost their first game to Team Pro Look and then beat Gym Rats, Blue Star Md., and J.B. Hoops Show to take the Steel Bracket. The 16U also took the Steel bracket. They lost their first game to N.Y. Panthers and then beat Frim AC (PA), N.J. Pirates, and Montgomery Cougars to take 1st in the Steel bracket. May 19-20: 16U won the gold at the Harrisburg Super Regional. Below is a game by game summary. Ballers faced an athletic and energetic Team Insane from suburban Philadelphia. This was a close game throughout, with the Ballers opening up a nearly 20 point lead late in the 2nd half, thanks to Anthony Ferguson being a key piece in the center of the press break and hitting his teammates in stride for easy buckets. Holding off a late surge by Team Insane, the Ballers came through with a 10 point victory. The Balllers put out an even backcourt effort with balanced scoring and ball sharing, led by 10 from Justin McCarthur. Anthony "A" Wright poured in 10, and Josh Trumpy led the Ballers with 15, including two above the rim throwdowns. Outmatched from the jump, Team Bison got a full view of CPB offensive prowess. While Dom Antonelli controlled the pace, dished the rock and added 12 pts, James Ezell and A. Wright provided offensive weight with 11 and 16 points respectively. Josh Trumpy was the high flying act of the game with 23 points, including three impressive dunks and several above the rim rebounds. In a rematch that was close in the first half, CPB stormed away with another lopsided victory. Dom Antonelli chipped in 12, and Josh Trumpy led the Ballers in scoring again with 21, but this game belonged to A Wright. Controlling the offensive glass with putback after putback, A Wright showed why the CD East faithful have something to be excited about next year. Against the most athletic team they faced in the tourney, CPB found a way to hold off a very talented Luzerne County squad. Takhi "Lockdown" Turner held their leading scorer who was averaging 23 points per, to 3 points in this contest. The backcourt trio of James, Dom and Justin poured in 34 points combined and kept the pace in the CPB favor. Out front, A Wright led the Ballers with 16 by showcasing his superb sticktoitevness and mid range jumper. Takhi Turner and Anthony Ferguson proved their mettle in the hustle and defense department, taking charges and clawing for loose balls at every chance and also dropped 12 points between them. In the title game against a very deep Connecticut Elite team, CPB put on a clinic of the game as, due to injury, they were forced to play much of the game with only 5 players. With A Wright (ankle) and Takhi Turner (ankle), out for most of the game, CPB shared the ball, played excellent defense and showed just how much talent this team has. Justin McCarthur showed both his outside range with several 3's as well as his ability to take the ball to the rack, and James Ezell proved yet again to be one of the most intense and intimidating players on the 16U stage with his heads up defense and in your face style of play. This game, however, belonged to future Trinity Shamrocks Josh Trumpy and Dominic Antonelli, who both poured in 17. Showing the power of the inside out game and their ability to make you pick your poison and defend one or the other, several plays ended with either an Antonelli jumper from long range or a Trumpy dunk. These two will be exciting to watch next year for Coach Kostelac. The 17U also won the gold at the Harrisburg Super Regional. 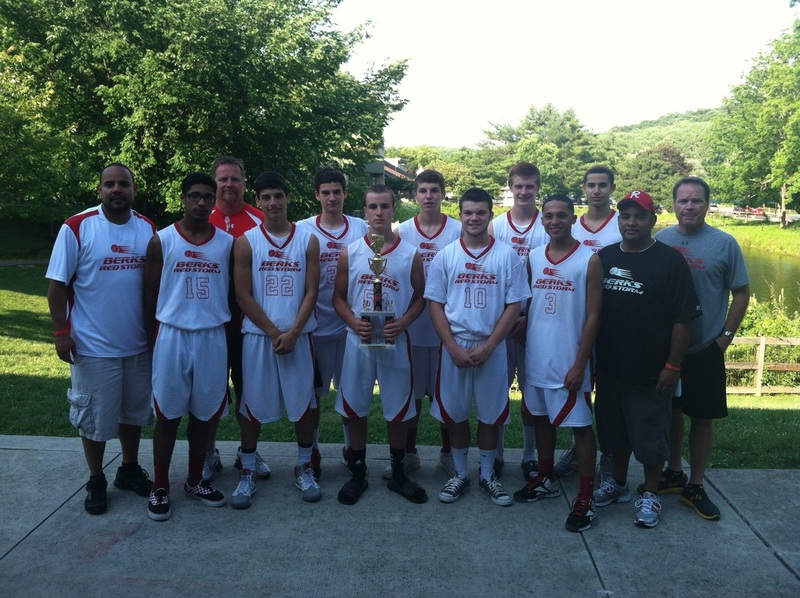 June 2nd/3rd: Both the 16U and the 17U made the finals of 17U The Show Tourney in Harrisburg. They shared the title. July 18th/19th: 16U reach the semi's of the Silver Bracket at the AAU Super Showcase in Orlando, Florida. Carlisle and York areas were selected. 4/21-4/22: Beat Grassroots Canada 1 by 9 (Dalton Cesarz with 17, Dre Marshall with 16, and Jalin Williams with 15) Then in a tight battle lost by 1 to Pa Pump n Run. Then won vs Cleveland OH Cavs Team by 15. 4/28-4/29 Philly: Lost to SMAC Ballers and NJ Playaz. April 22nd: Joe Marshall, Jahaad Proctor, and Bud Mack receive recognition for play at Big Shot Baltimore. April 28-29th: 17U lost to Las Vegas Prospect, lost to Team Melo, and lost to Baltimore Wildcats. 16U beat VA Bulldogs, lost to ECE/NJ ABC, beat Cecil Kirk MD, and lost to SYF Playaz (IN). 15U lost to DC Assult, beat Philly Pride, and lost to J.B. Hoops Cooper. May 19th/20th: 15U won the gold at the Keystone Blazers Tournament. 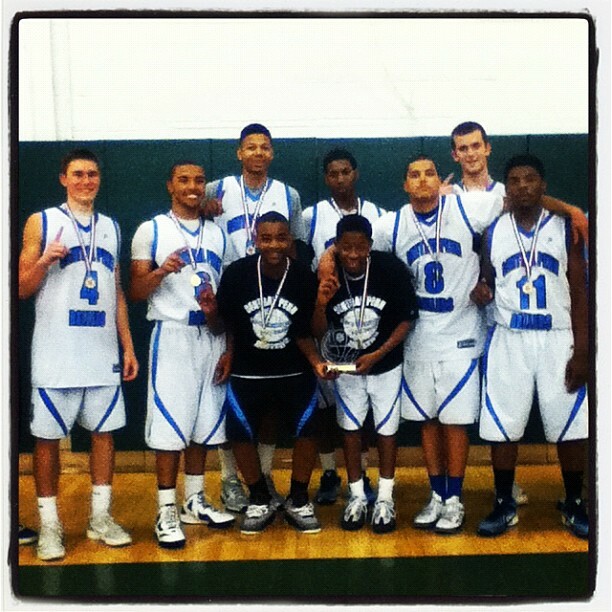 June 2nd/3rd: 17U won the gold bracket at Hershey Big Shots. Tavon Parker won MVP. 16U won the silver bracket at Hershey Big Shots. Sam Light won MVP. 15U played up a class and came in 2nd in the 16U gold bracket.